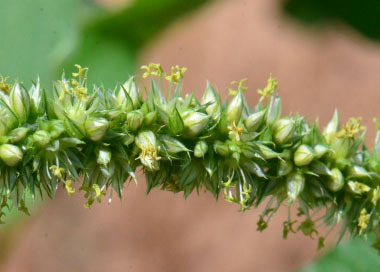 Palmer's amaranth is native to the southwest U.S. and Mexico, but it has aggressively expanded its range, becoming invasive in many parts of the world. This plant was widely used for food by Native Americans of the Southwest. It is a traditional food of Native Americans including the Navajo, Pima, Yuma and Mohave. Its life-cycle is adapted to desert conditions; it will germinate and grow quickly to produce abundant seed (up to 500,000 seeds per plant) when water is available. Palmer’s Amaranth was named in honour of Edward Palmer (1829–1911), a self-taught British botanist and early American archaeologist. 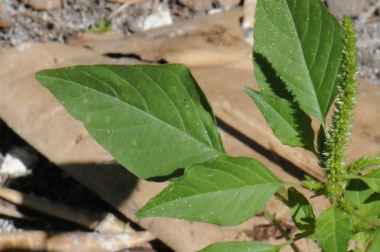 Distinguishing Features: Palmer amaranth is a summer annual that commonly reaches heights of at least 1 metre (3') with many lateral branches. 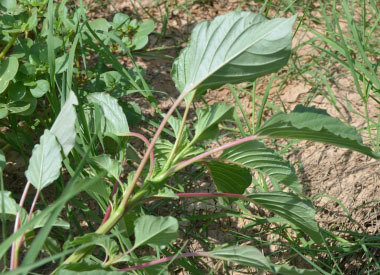 Stems and foliage are mostly smooth and glabrous. Leaves have fairly long petioles and are arranged symmetrically around the stem; this gives the plant a distinct pointsettia-like appearance when viewed from above. 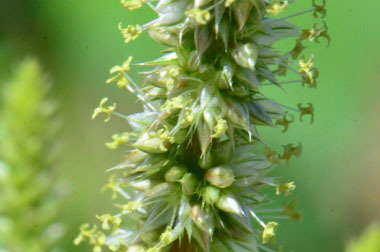 Flowers: Female and male flowers occur on separate plants, but are both 2 to 3 mm each, clustering in cylindrical inflorescences or spikes up to 60 cm on the central stem. The flowers are white or whitish-green. The fruit is a thin-walled one-seeded utricule about 1.5 mm long. The top half of the fruit separates at maturity to expose the single, round, black to dark purple seed which is of 1 to 2 mm in diameter. 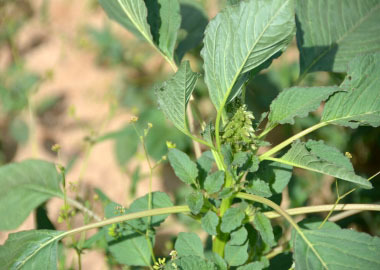 Fields of Nutrition has medicinal benefits and vitamin/mineral content of Palmer's Amaranth. Leaves: Leaves are alternate, hairless, borne on long petioles that often exceed the length of the leaf blade, they are lanceolate in young plants and become ovate as the plant matures, with prominent whitish veins on the underside. The leaves often have a distinctive V-shaped chevron on the upper surface. Height: Typically, this plant grows between 1 and 1.5 metres in height (just over 3”). However, in areas that have been extensively sprayed with chemicals, this plant has fought back and can reach heights of up to 2 metres (6') and even higher. The stem is reddish in colour. 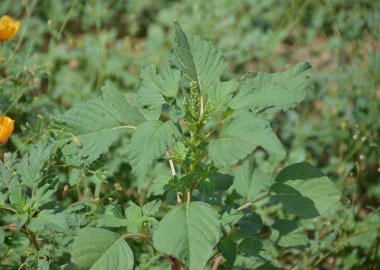 Habitat: Palmer amaranth is commonly found in farmer's fields. This plant prefers arable land; deserts (sparsely vegetated areas); road and rail networks and associated land; other artificial surfaces (wastelands). Typically it is found in southwest US, but it is also found in many countries worldwide. 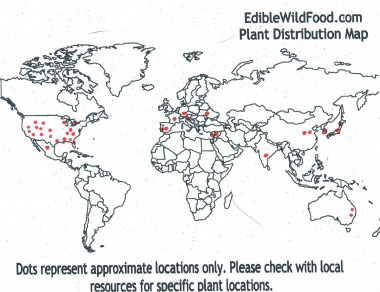 Palmer amaranth is documented in 28 states including South Dakota, Iowa and Wisconsin. It has even been documented in Lyon and Yellow Medicine Counties in Minnesota. Edible parts: Leaves can be used fresh or cooked. They can also be dried for later use in soups or stews and they can be kept in the freezer for later use. Very small seeds were once commonly cooked. They are easy to harvest and they are very nutritious. Seeds ground into a powder, can be used in baking. Whole seeds are gelatinous and difficult to crush in the mouth; they should be ground before use. 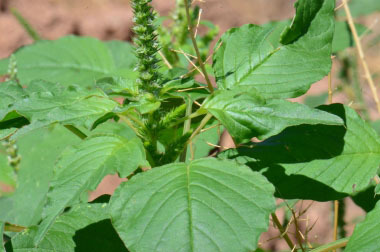 Similar plants: Redroot Pigweed, Powell's amaranth. Heartfelt thanks go out to Eugene Sturla of Southwest Desert Flora. His generosity of providing all images of this plant made this page possible.